If there’s one thing Singaporeans will never tire of, it’s Japanese food! Happily, new Japanese restaurants are popping up every year to satiate our enormous appetites, but our favourite Japanese culinary exports (like fresh slabs of sashimi) can also be one of its most expensive, and if you’re not careful, that delicious sushi dinner can easily set you back hundreds of dollars. Not to worry – for the benefit of your wallet we’ve taken on the trying task of eating our way through Singapore’s multitude of Japanese restaurants to bring you some of the best and most affordable spots on our sunny island. Itadakimasu! You’ve probably seen a couple of Teppei Syokudo stalls all around Singapore serving up bowls of Kaisen-Don tossed in their signature specialty Bara Chirashi sauce (Teppei-san has it specially manufactured in Japan), but the original restaurant at Tanjong Pagar is where the party’s at! An assortment of generously cubed fresh Salmon, Tuna, Cuttlefish, Scallop and Swordfish sashimi pieces lies atop a bowl of warm, fluffy Japanese rice, topped with seaweed flakes, spring onions, sprouts and a sprinkling of Ikura ($17.60). The Bara Chirashi sauce is reminiscent of Japanese Soy Sauce, but with a touch more umami flavour. Oishi! Shin Minori has been named the winner for ‘Best Buffet’ in Chope’s Diners Choice Award in 2016, and for good reason: you can treat yourself to 8 different types of fresh sashimi, a large variety of sushi, temaki and makimono, and a plethora of grilled and fried options – all for the low price of $37++ for lunch and $39++ for dinner! It’s the perfect place for get-togethers, made even better with their 10th anniversary promotion menu (available till the 31st of May 2017) – free flows of red wine, white wine, sake, beer, umeshu soda, fruit juice and soft drinks for an additional $10! If you’re looking for a reason to celebrate, this is it. Despite its name, Standing Sushi Bar doesn’t actually require its customers to stand and consume their sushi. Just as well, for it’s going to take us a while to take full advantage of the restaurant’s generous promotions. On Mondays and Thursdays, gorge yourself on tender Salmon Sashimi with Standing Sushi Bar’s promise of 5 slices for a mere $3. Then come back on Try Us Tuesdays and eat your way through the restaurant’s nigiri sushi selection, including classics like Mackerel, Yellowtail, Salmon, Ebi, and Tuna for half-price. It’s probably a good thing they don’t offer these promos every day of the week because we’d never leave! Sushiro is situated at Thompson Plaza and serves up amazing bowls of Bara Chirashi don as well, and among one of the cheapest at only $12.90! Their generous bowls contain large cubes of sashimi – namely Salmon, Tuna, Octopus, Scallop and Prawn, along with a sprinkling of Ikura for a burst of umami flavour. The sashimi is covered with a slightly sweet and sticky sesame sauce, definitely your cup of tea if you’re into sweet-savoury foods. There’s usually a queue outside before the tiny store even opens, so go early or be prepared to wait in line! We’re pretty sure you already know about The Sushi Bar – how can you not? This place serves up amazingly fresh and thick cuts of sashimi, specialty rolls and chirashi dons at affordable prices. We’re obsessed with their Chirashi Don ($19.90) and their phenomenal Soft Shell Crab Salmon Aburi Roll ($17.90) – truly the stuff of dreams! Their Far East Plaza joint was so incredibly popular that they’ve expanded and opened up a second branch at Ngee Ann City. Did someone say buffet? Mitsuba Japanese Restaurant offers an all-you-can-eat sushi and sashimi buffet from its a la carte menu for less than $40, with a 25% discount for groups of four adults. We threw restraint out the window and immediately indulged in delicious Sashimi Moriawase ($30): two of each of the six types of sashimi, Negi Toro (Tuna belly) Handroll ($10), and Tobikko Sushi ($4). For the less voracious, choose a set meal like the Unagi Kagayaki ($28): grilled, soft freshwater eel accompanied by a bowl of rice, an appetizer, fruit and miso soup. Tucked away in Anson Road, Shinagawa Ramen & Izakaya offers simple, unpretentious and (most importantly) delicious Japanese fare. We loved the Salmon Mentai’s tender slices of salmon sashimi topped with salted cod roe ($5.00), and the restaurant’s Chirashi Don: generous slices of mouthwatering sashimi atop a bed of perfectly prepared sushi rice. To sweeten the deal, visit the restaurant during weekdays for its promotional specials, which include a main course, a side dish and dessert for under $20. With value like that, how can we decline? 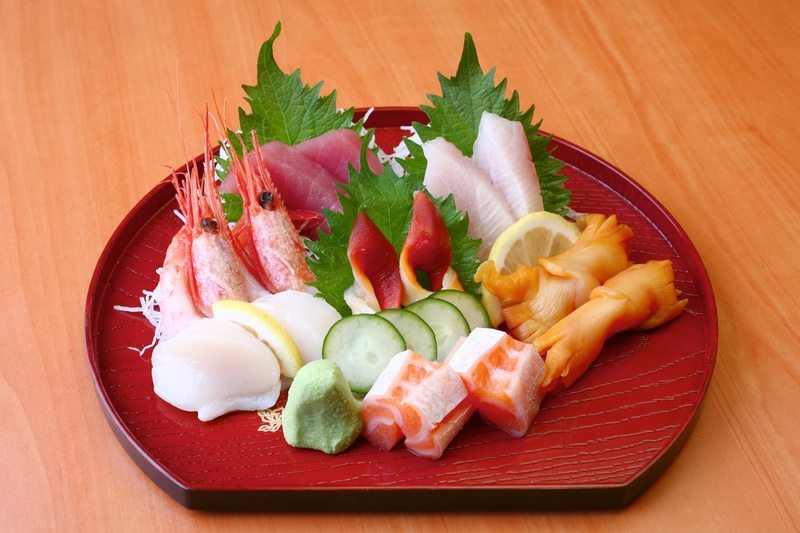 With its widely diverse menu we guarantee you’ll be spoilt for choice in Otaru Suisan. Start with classic appetizers like a refreshing Takoru ($6.80): cool, chewy slices of fresh octopus with cucumber and seaweed in a sweet vinegar sauce, or order the Pan Fried Chicken Gyoza ($7.00) and crunch into juicy chicken tucked in a crispy dumpling skin. Sushi lovers can also sample from the restaurant’s numerous sushi dishes, but if you’re having trouble choosing (truly, we sympathise), order the Nigiri Ume, which promises nine different nigiri for less than $20. We were also fans of the Barachirashi Don, which pleases both the stomach (thanks to hearty pieces of assorted sashimi on a heaping bowl of rice, accompanied by a steaming bowl of miso soup) and the bank account for under $25. As the restaurant’s name suggests, Watami Japanese Casual Restaurant caters to diners looking for a tasty, leisurely, and, of course, affordable meal. Sink your teeth into a crunchy Spider Roll ($19.90) – fret not, it’s not actually made of spiders, but heavenly deep fried soft shell crab – or order a melt-in-your-mouth Kagoshima Wagyu Beef Sushi ($7.90). For heartier fare, go for the Hokkaido Salmon Roe Sushi Rice Bowl. With its abundance of soft, piquant, salmon roe on rice for less than $25 it’s a bargain you can’t beat with a stick. Japanese Fine Dining for less than $30? Sign us up please! We especially loved Marukyu’s Yaki Sakana Lunch Set ($16): its salty, flaky grilled mackerel was perfect when enjoyed with fluffy white rice, and comes with a side of sashimi and miso soup. The Salmon Teriyaki & Scallop Butter Yaki set ($21) is a must try as well, consisting of grilled salmon with sweet teriyaki sauce and large scallop medallions with butter sauce. Indulgent tip: if you’re feeling particularly flush from all the money you’ve saved up from dining at the previous restaurants on the list, spring for Marukyu’s Omakase sets ($68 or $88) and let the chef decide your meals for you. Try your luck @ Lucky Bar!